It’s time. In the words of Michael Buffer, let’s get ready to rumble. We’ve seen our field of 68 BSU alums and friends of the institution come down to two remaining titans. In an ironic twist of fate, one semi-finalist works in the building named for the other. Dave Letterman, late night kingpin, CBS heavyweight, BSU alum takes on Chris Taylor, BSU instructor, notorious sports production expert, and one of the most popular and well-connected people on campus. 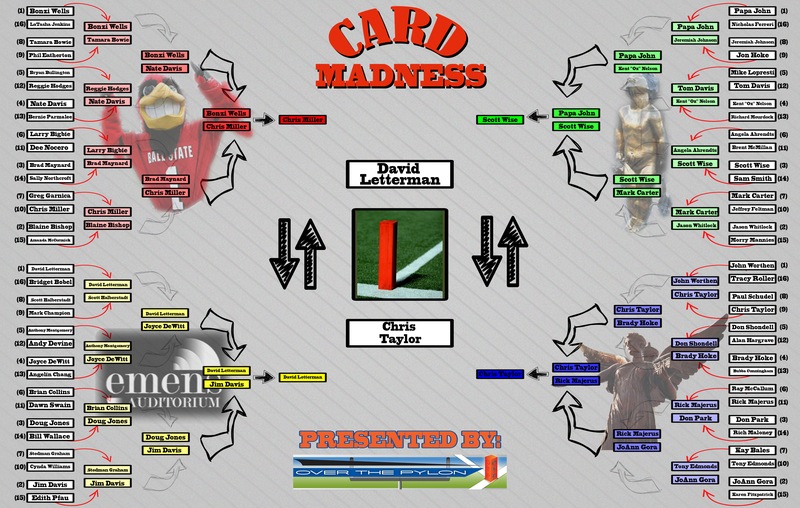 It’s a CardMadness showdown that’s fitting and appropriate for this our inaugural edition. Letterman as a 1-seed made his way to the finals by besting the likes of Miss USA contestants, Hollywood celebrities, Garfield’s creator, and one of the best punters to ever grace the appropriately-named Punter U of BSU. Taylor had to advance as a 9-seed over two former football coaches, a 1-seed former President, an upstart former basketball coach, and the namesake of Scotty’s Brewhouse. The competition that led these two titans of Cardinal-dom to the Championship Game is almost as impressive as they are. Because of our late start this morning, we are going to audible a bit. Polling will be open until 9am Friday morning where our champion will be crowned. Get it on, got to get it on, no choice but to get it on. Mandate… get it on.